This is anything BUT slimming, but still worth including for this time of year. Once made, the dough can be baked straight away, or kept for a few days in a sealed plastic bag in the fridge. It is best to make the house over two days: the first day you bake and decorate the pieces, the second day assemble them. 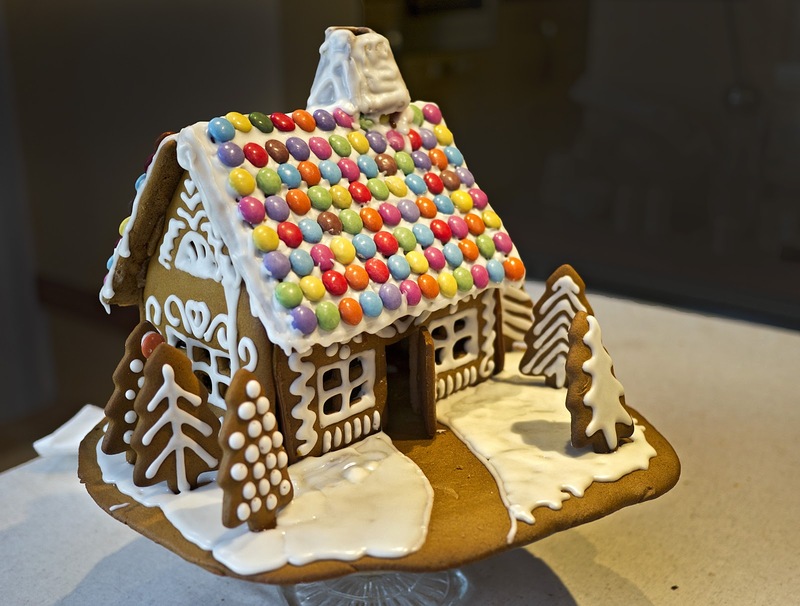 If you try and decorate them after the house has been assembled, the icing runs – great for icicles, not so good for patterns. 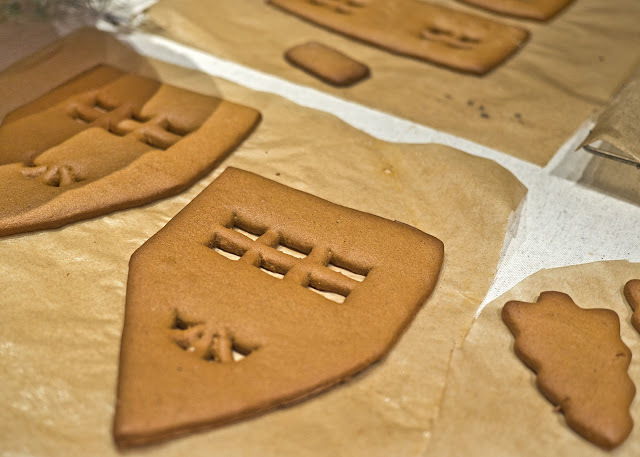 According to the recipe, you can use brown or white sugar – I used unrefined caster sugar. I also found that I needed almost three times as much icing as they suggested. The dough makes more than enough for the house and the base, with plenty extra for trees, men, stars and other biscuits to nibble on while you wait for Demolition Day! Place sugar, syrup and spices in a saucepan and bring to the boil (It is best to use a large saucepan for this, as the mixture starts to foam and expand as soon as you add the bicarbonate of soda. ). Add the bicarbonate of soda and stir until it is becomes frothy. Place the butter in a bowl and add the hot sugar mixture, stirring until the butter has melted. Add the eggs and leave to cool. When the mixture has cooled, gradually add the flour, stirring well between each time (I used a food mixer for this). I found the dough was easier to use after 10-15 minutes, rather than immediately after it was made. 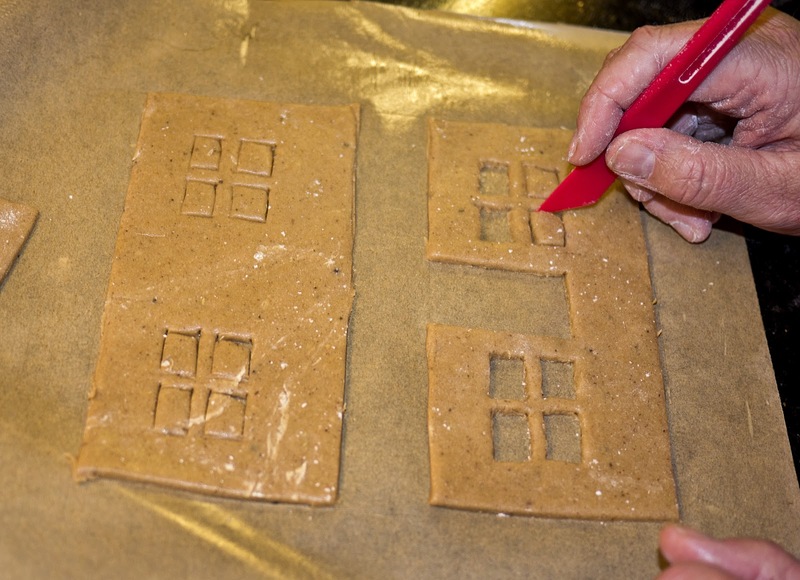 Roll out the dough directly on the baking plate (I used greaseproof paper on top of the tray) to a thickness of around 3mm, and cut out the pieces using the templates (including the holes for the window and doors – the door gets bakes separately). Make two of each piece, plus a base large enough to take the finished house. Bake the pieces, leaving enough space between each piece for them to expand slightly, at 180°C for ten minutes. 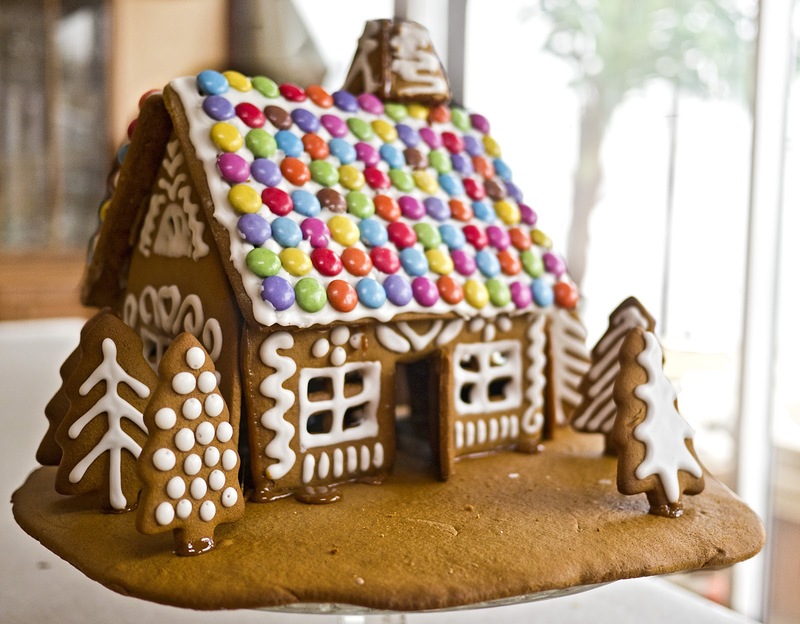 Leave to cool before decorating. When the biscuits have cooled completely, decorate with the icing. Mix together all the ingredients and stir well, then pipe out the pattern – the only limitation here is your imagination! 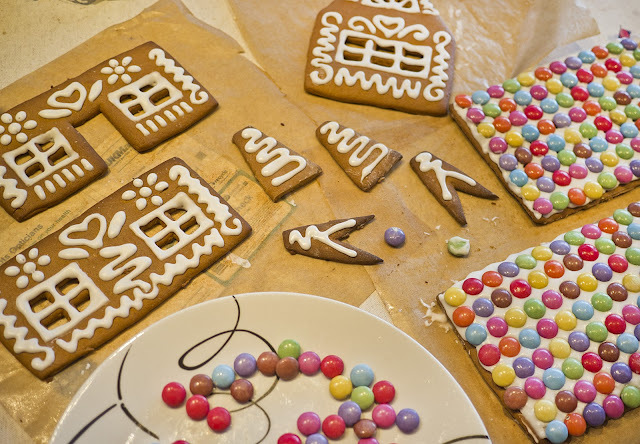 Add Smarties or any other colourful candy while the icing is still soft, pressing them firmly into the icing. Leave the icing overnight to set completely. The following day, melt the sugar on a wide pan and dip the pieces in the sugar on the edges they will be joined with another piece. It is best to have two people do this – one to dip and the other person to hold the pieces in place as you join them. Just be very careful you drip hot sugar on your assistant – as it WILL burn and blister the skin (as my husband found out)! 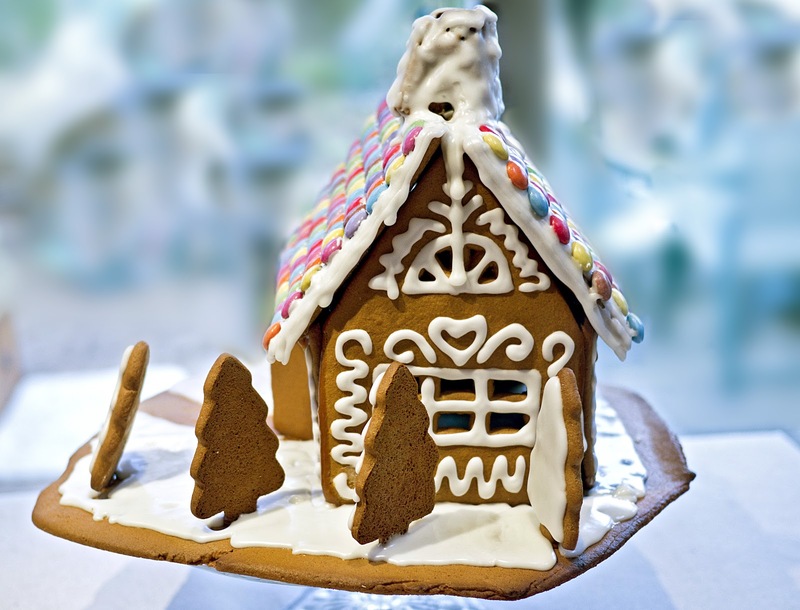 Once the house is all assembled you can touch up with any icing to create snow, icicles and cover up any cracks etc. The house is assembled, but I think it needs a little snow on the ground. The house will keep well for at least a couple of weeks and still be OK to eat.